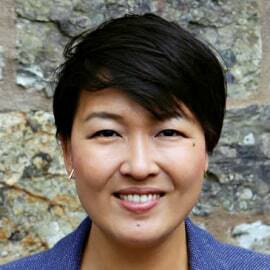 Sarah Shin is the Associate National Director of Evangelism overseeing the creation of relevant tools that catalyze student witness at InterVarsity Christian Fellowship (IVCF). She is a speaker and trainer in ethnicity, evangelism, and the arts. Prior to ministry, Sarah helped create master plans envisioning ten to twenty year futures for cities and neighborhoods in the United States and abroad. Sarah loves equipping students and churches with tools that integrate evangelism with ethnic reconciliation, justice, beauty, and technology. She frequently teaches at campuses, chapels, conferences, churches, and seminaries. A fine artist and painter, Sarah has a Masters of Arts in Theology from Gordon-Conwell Theological Seminary (South Hamilton) and a Master’s in City Planning and Development from MIT. She and her husband Shin Maeng live in Cambridge, Massachusetts and love to cook, paint, and host strangers in the city together.